British Transport Police say the death toll in the Croydon tram crash has risen to seven, with dozens more injured in hospital. Deputy Chief Constable Adrian Hanstock said: “This is a tragic incident and our hearts and thoughts go out to all those affected. “After liaison with the Coroner, we can confirm that at least seven people have lost their lives as a result of this incident." “Our officers will continue to work tirelessly throughout the evening to formally identify them and provide care and support for their families." “Identifying those who have died can be a complex and lengthy process and we want to ensure we get this right." “We expect to be at the scene for at least the next 24 hours, continuing searches and carrying out forensic examinations in support of the investigation into the circumstances, and in order to provide a report for the Coroner." “Tomorrow, we will assess how and when it is appropriate to recover the tram and remove it from the tracks." “I want to thank everyone who assisted at the scene, and behind the scenes, in Croydon today." A 42-year-old man from Beckenham, believed to be the driver, has been arrested on suspicion of manslaughter and is currently in police custody. 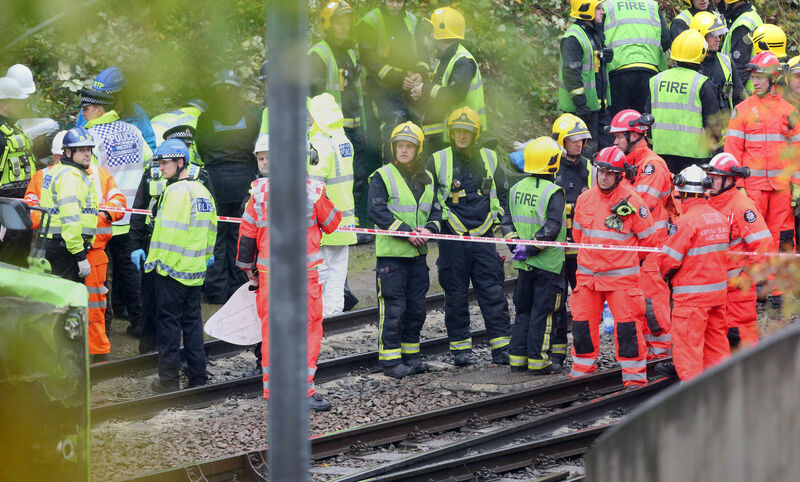 The Rail Accident Investigation Branch told PA that the tram was travelling on a “sharp, left-hand curve” with a speed limit of 12 miles per hour. Around 100 emergency vehicles are at the scene at the Sandilands tram stop Addiscombe Road. The incident, which involved a vehicle with two carriages, occurred in a tunnel, Transport for London said. Police were called to the scene at Sandilands tram stop in Croydon at around 6.10am. “At present, we can confirm five people have sadly died following this incident.More than 50 others have been taken to hospital with injuries,” the British Transport Police said. Pictures showed large numbers of emergency vehicles at the scene and people reported seeing victims being carried to ambulances on stretchers. Someone understood to familiar with the scene, who called themselves @procrastinateur, tweeted: "Loads of emergency services at Sandilands tram station in Croydon Possible fatalities after tram derailment." Hannah Collier tweeted: "Heard a massive crash outside my window, now emergency services everywhere for the overturned tram, hope everyone is OK."
A London Ambulance Service spokesman said: “We have treated a number of patients at the scene and took 51 patients to hospital. Twenty were taken to St George’s University Hospital and 31 to Croydon University Hospital." Tfl said the tram service is currently suspended between Reeves Corner and Addington Village/Harrington Road and police advised motorists to avoid the area around Addiscombe Road.